Average insurance rates for a 2001 Toyota Camry are $942 a year for full coverage. Comprehensive insurance costs an estimated $144 a year, collision costs $188, and liability coverage costs around $452. Buying a liability-only policy costs as low as $504 a year, with high-risk insurance costing $2,024 or more. Teenage drivers receive the highest rates at $3,838 a year or more. Rate data is compiled from all 50 U.S. states and averaged for all 2001 Toyota Camry models. Rates are based on a 40-year-old male driver, $500 comprehensive and collision deductibles, and a clean driving record. Remaining premium consists of UM/UIM coverage, Medical/PIP, and policy fees. For the average driver, prices range go from as low as $504 for only liability insurance to a high of $2,024 for a driver that may need high-risk insurance. These differences show why it is important for drivers to compare prices for a targeted area and risk profile, rather than using average rates. Finding better insurance prices for a Toyota Camry can normally be an all-consuming task, but you can learn our insurance coverage buying tips to find lower rates. There are both good and bad ways to compare insurance coverage rates and we’ll show you the quickest way to get price quotes for your Toyota and get the lowest possible price either online or from local insurance agents. You need to compare prices yearly because prices change quite often. Even if you got the best rates for Camry insurance a few years ago there is a good chance you can find better rates now. Block out anything you think you know about insurance coverage because you’re about to find out how to use online quotes to save money, get proper deductibles and limits, all at the lowest rate. If you are insured now or are shopping for new coverage, you can use these tips to reduce the price you pay while maintaining coverages. Pricing cheaper insurance coverage can be fairly easy. Consumers just need to learn the best way to compare prices online. Smart consumers have a good feel for some of the elements that come into play when calculating the rates you pay for insurance. Understanding what impacts premium levels helps enable you to make changes that can help you get better insurance rates. Never allow your policy to lapse – Driving without insurance is against the law and your next policy will cost more because you let your coverage have a gap. And not only will insurance be more expensive, but not being able to provide proof of insurance might get you a hefty fine and possibly a revoked license.Then you may be required to provide proof of insurance in the form of an SR-22 filing with your state motor vehicle department. Increase deductibles and save – Physical damage coverage, otherwise known as comp (or other than collision) and collision, is used to repair damage to your Toyota. Some examples of claims that would be covered could be a windshield shattered by a rock, collision with an animal, or theft. Your deductibles are how much you are willing to pay in the event of a claim. The more the insured has to pay upfront, the less your insurance will be for Camry insurance. Safe vehicles cost less to insure – Vehicles with high crash test scores tend to have better insurance rates. Safer cars have better occupant injury protection and any reduction in injury severity means less money paid by your insurance company and thus lower rates. If your Toyota is rated at least an “acceptable” rating on the Insurance Institute for Highway Safety website or four stars on the National Highway Traffic Safety Administration website it is probably cheaper to insure. Save money with special equipment – Choosing a vehicle with anti-theft technology or alarm system can get you a discount on your insurance. Anti-theft features such as vehicle immobilizer systems, General Motors OnStar and LoJack tracking systems can thwart your car from being stolen. The method we recommend to get rate comparisons is to know almost all companies actually pay money for the chance to give rate comparisons. To begin a comparison, all you need to do is take a few minutes to give details such as how much you drive, an estimate of your credit level, types of safety features, and deductibles desired. That information is instantly sent to multiple companies and you will receive price estimates instantly to find the best rate. Insuring your fleet can be pricey, buy you may qualify for discounts that you may not know about. Certain discounts will be applied when you complete an application, but some may not be applied and must be specially asked for before you get the savings. If you’re not getting every credit you qualify for, you are throwing money away. Auto/Life Discount – Companies who offer life insurance give lower rates if you buy life insurance. Auto/Home Discount – If you insure your home and vehicles with the same insurance company you will save at least 10% off all policies. Discount for Swiching Early – Select companies give a discount for signing up prior to your current policy expiring. The savings is around 10%. Theft Prevention System – Vehicles with anti-theft systems prevent vehicle theft and therefore earn up to a 10% discount. New Car Discount – Adding a new car to your policy can save up to 30% due to better safety requirements for new cars. Distant Student – Any of your kids living away from home attending college without a vehicle on campus may qualify for this discount. Memberships – Affiliation with certain professional organizations could qualify you for a break when shopping for insurance for Camry insurance. Air Bag Discount – Factory air bags or motorized seat belts may earn rate discounts of more than 20%. Multiple Cars – Buying coverage for all your vehicles on the same insurance policy could earn a price break for each car. As a disclaimer on discounts, most discount credits are not given to the entire policy premium. A few only apply to the price of certain insurance coverages like liability and collision coverage. Just because you may think it’s possible to get free car insurance, insurance companies aren’t that generous. But any discount will reduce your premiums. To see a list of companies with discount insurance rates, click this link. When should I talk to an agent? When it comes to buying coverage for your vehicles, there is no best way to insure your cars. Everyone’s situation is a little different. These are some specific questions may help you determine if you might need an agent’s assistance. Should I rate my 2001 Toyota Camry as pleasure use or commute? Is my 2001 Toyota Camry covered for flood damage? What happens if I owe more than my 2001 Toyota Camry is worth? If you don’t know the answers to these questions but a few of them apply, then you may want to think about talking to an insurance agent. If you want to speak to an agent in your area, simply complete this short form. It’s fast, free and can help protect your family. Having a good grasp of a car insurance policy can help you determine the right coverages and proper limits and deductibles. The coverage terms in a policy can be ambiguous and reading a policy is terribly boring. Collision coverage covers damage to your Camry caused by collision with an object or car. You first must pay a deductible then the remaining damage will be paid by your insurance company. Collision insurance covers claims like backing into a parked car, driving through your garage door, colliding with a tree and colliding with another moving vehicle. Paying for collision coverage can be pricey, so consider removing coverage from vehicles that are older. 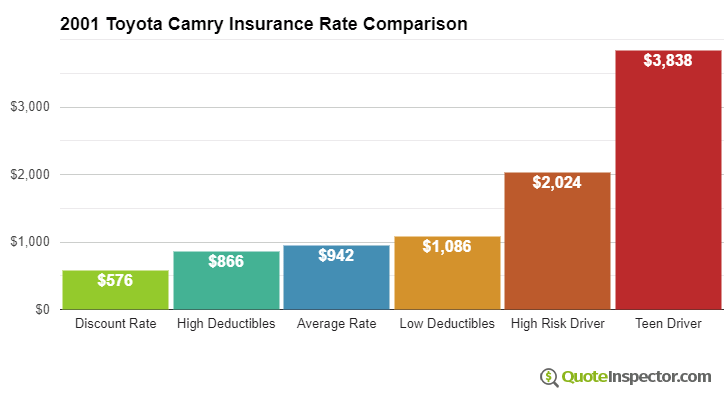 You can also choose a higher deductible to save money on collision insurance. This will cover damage or injury you incur to a person or their property by causing an accident. It protects you from claims by other people. Liability doesn’t cover damage to your own property or vehicle. Split limit liability has three limits of coverage: bodily injury per person, bodily injury per accident and property damage. You might see liability limits of 25/50/25 which stand for a limit of $25,000 per injured person, a total of $50,000 of bodily injury coverage per accident, and a total limit of $25,000 for damage to vehicles and property. Alternatively, you may have one number which is a combined single limit that pays claims from the same limit rather than limiting it on a per person basis. Liability coverage pays for claims like funeral expenses, medical services, bail bonds, court costs and emergency aid. The amount of liability coverage you purchase is a decision to put some thought into, but buy as large an amount as possible. This coverage pays for damage OTHER than collision with another vehicle or object. You need to pay your deductible first then the remaining damage will be covered by your comprehensive coverage. Comprehensive can pay for claims such as hitting a bird, vandalism, a broken windshield, damage from getting keyed and damage from flooding. The most a car insurance company will pay at claim time is the actual cash value, so if the vehicle is not worth much it’s probably time to drop comprehensive insurance. This coverage protects you and your vehicle from other drivers when they are uninsured or don’t have enough coverage. Covered claims include hospital bills for your injuries and damage to your Toyota Camry. Since a lot of drivers have only the minimum liability required by law, it only takes a small accident to exceed their coverage. This is the reason having UM/UIM coverage should not be overlooked. Normally your uninsured/underinsured motorist coverages are similar to your liability insurance amounts. When trying to cut insurance costs, never buy less coverage just to save a little money. In many instances, an accident victim reduced full coverage only to discover later that saving that couple of dollars actually costed them tens of thousands. Your strategy should be to find the BEST coverage for the lowest price, not the least amount of coverage. You just read some good ideas how you can shop for 2001 Toyota Camry insurance online. The key concept to understand is the more price quotes you have, the more likely it is that you will get a better rate. Consumers could even find that the lowest priced insurance comes from the least-expected company. Drivers who switch companies do it for a number of reasons such as extreme rates for teen drivers, questionable increases in premium, denial of a claim and even delays in paying claims. Whatever your reason, finding a new insurance company can be easier than you think.